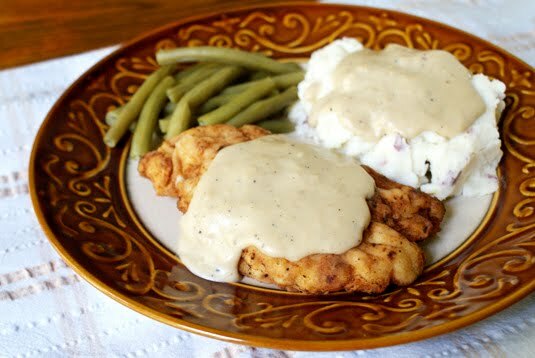 I'm sure you've heard of Chicken Fried Steak, which is pretty much the sister recipe to this one. Same concept, just switch out the beef for chicken. Trust me, we eat enough beef around here. I prefer tender, juicy chicken breasts coated in a golden crispy crust covered in creamy peppery gravy...mmmm. Throw a generous helping of silky smooth mashed potatoes on the side and you've got perfection on a plate. Yum, yum and yum. This one'll stick to your ribs and leave your tummy satisfied, I can guarantee that. My husband took one bite and gave me the, "This is good." On the first bite. Now that's success and makes me one happy mama. 1. 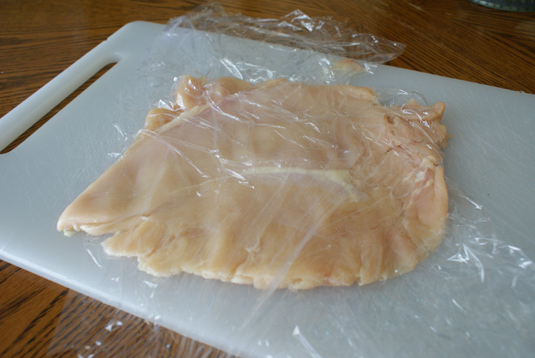 Pound chicken breasts between two pieces of cling wrap with a meat tenderizer or a rolling pin until they are about ¼ inch thick. I use my trusty rolling pin. Be careful that the chicken doesn't start breaking apart into pieces. 2. I like to cut my large pieces into smaller ones for easier flipping in the frying pan and to make plate-friendly portion sizes. I cut the large pieces into 3 small ones. Or you can leave the pieces monster huge. It's up to you. Season both sides of the chicken with salt and pepper. 3. 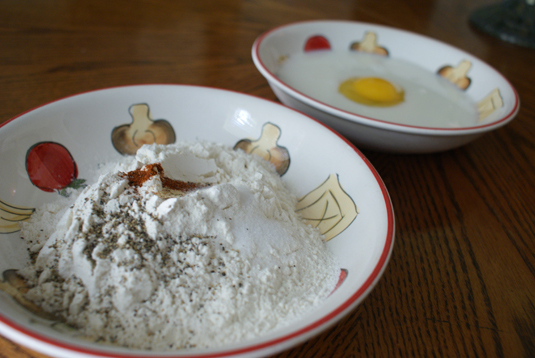 In a shallow dish (pie plates work well, too) combine the flour, garlic powder, 1 tsp salt, ½ tsp pepper and cayenne pepper The seasoning amounts are just estimates, so feel free to add more or less to your liking. This is approximately what I added. Maybe even a little more. In another shallow dish combine the milk and egg. Beat the egg with a fork or whisk until it's completely combined with the milk. 4. Set up your assembly line. 1. chicken 2. wet mixture 3. dry mixture 4. a clean plate for the coated chicken. Dip the chicken in the wet mixture, then the dry mixture, and repeat again with the wet mixture then the dry mixture. Each piece will be dipped four times before making it to the clean plate at the end. 5. Heat the canola oil in a heavy skillet over medium heat (I like to use my cast iron). 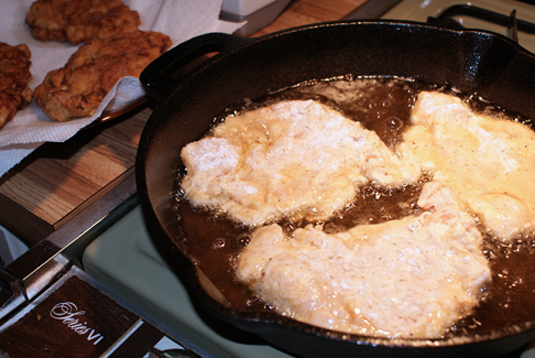 Use enough oil to coat the bottom of the pan, but not completely cover the chicken when it's added. Make sure it's good and hot before adding the chicken. Don't use high heat for the oil or it will burn the coating of the chicken before the inside cooks through. 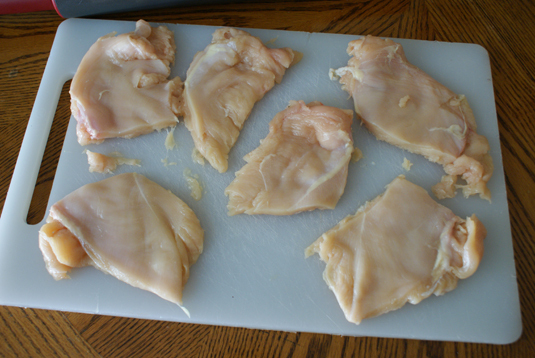 Fry the chicken in batches for about 3-3½ minutes per side. When you flip it, the coating should be golden and crispy. If it's not, it's not ready to flip. Place the cooked pieces on a paper towel lined plate. The finished chicken should be cooked to an internal temperature of 165° (it never hurts to bust out the meat thermometer and check one of your thicker pieces). 6. After frying all of the chicken, pour off the oil into a measuring cup, keeping as many of the brown bits in the pan as you can. 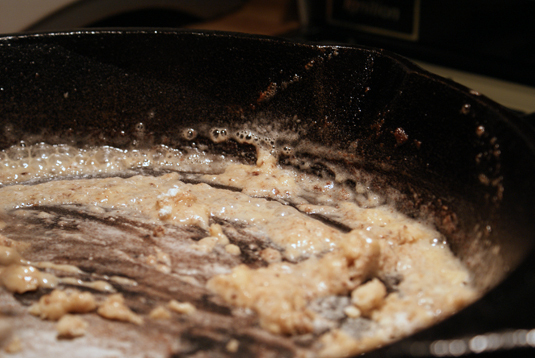 Put about ¼ cup of the oil back into the pan and add ⅓ cup flour, whisking to make a roux. Continue whisking the oil/flour mixture, scraping the brown bits up and continue cooking until the roux is a nice golden brown color. 7. 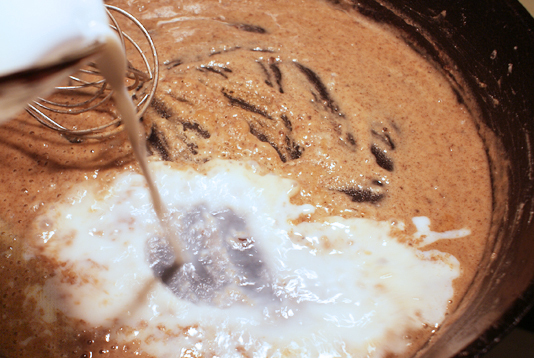 Slowly add the milk to the roux, whisking constantly until all of the milk has been combined. Add additional milk until the gravy is the consistency that you like. Then season, season, season with salt and pepper. Use lots of pepper and salt to taste. Keep adding seasoning and tasting until it tastes yummy. If you don't add enough seasoning, the gravy will just taste like liquid flour which is just plain yucky. If it doesn't taste good, you haven't seasoned it enough. Add, taste, add, taste. It'll get there. 8. 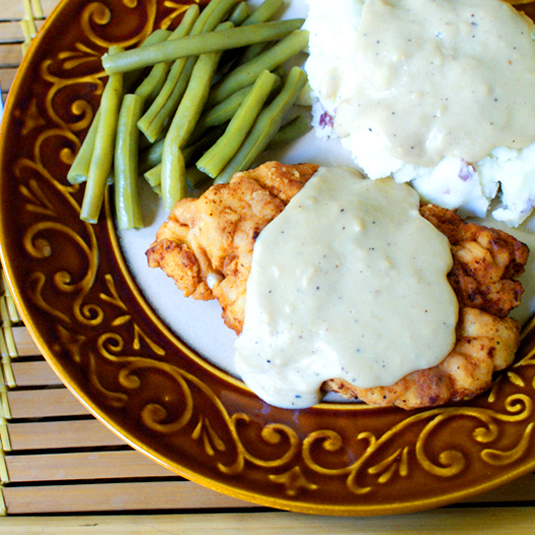 Serve with a side of mashed potatoes and slather the chicken and the taters with the pan gravy. You can find a perfect mashed potato recipe below. 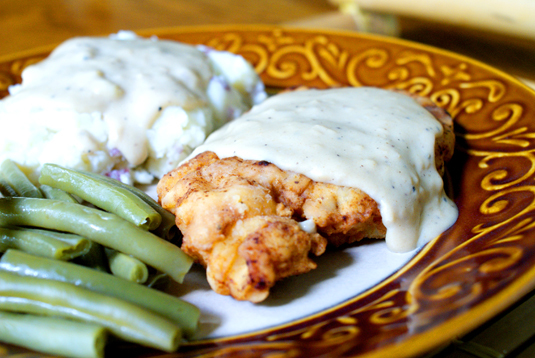 Try this recipe for chicken tenders! Omit making the gravy and serve with your favorite tender dipping sauce. YUM! I just made this for diner with collard greens instead of green bean, black eye peas and rice. Thanks. Simple to prepare and make. A very delightful diner. So glad you liked it, Andy J.
Homemade recipes are the best, aren't they? Thanks for sharing with me! I tried this tonight. It was great. Added Rotisseri seasoning since I didn't have cayenne pepper. Dipped in each mixture twice. chicken was crunchy and just wonderful. Will make again. I'm so glad! Thanks for letting me know how it turned out for you.